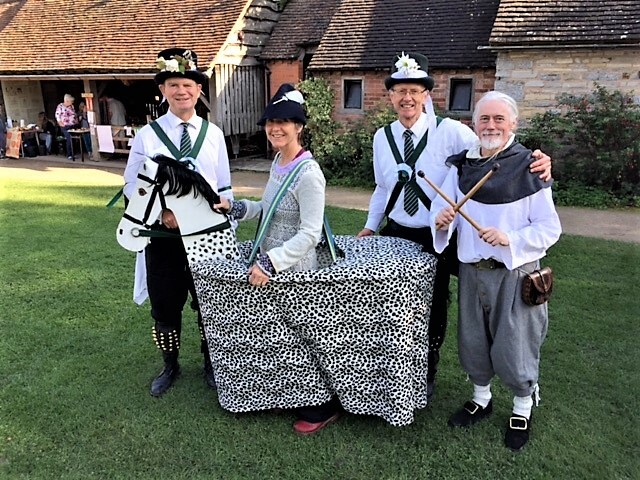 On Saturday 23 September, AVMM members Donald, David and Richard sang, played and demonstrated the Morris tradition at the Apple Day, Tudor re-enactment, Mary’s Arden’s farm at Wilmcote, near Stratford-upon-Avon. Built by Mary’s father, Robert Arden around 1514, Mary Arden’s House has been significantly altered over time. Today, visitors to Mary Arden’s Farm can peek inside the chimney and the walls, discover how the house was built and imagine what life must have been like for Mary when she lived here with her seven sisters. Add to this, the Apple Day events with many demonstrations of traditional crafts, song and dance. As ever at this event, there were a lot of children who enjoyed interacting with Charlie our hobby horse (ridden by Liz, a visitor from the USA) and many of them joined David and Richard by participating in the Shepherd’s Hey. Our thanks to Donald for organizing an excellent day. On a showery Saturday in September, 17 members of the side assembled from seven counties to pay tribute to two stalwarts of Adderbury Morris from different eras. After a moving ceremony to commemorate the centenary of George Robins’ death described previously by Dave Reed, we met at The Black Boy to celebrate our Treasurer and long-term supporter, Chris Garrett’s birthday. It was a great pleasure to mark the dancing debuts of two new members of the side, Troy and Dylan. The latter is John’s grandson; aged six, he has a great dancing career ahead of him. Dylan’s presence meant that Alfie Newman, Chris G’s grandson, who also danced splendidly, is no longer the youngest member of this side. Both of our latest recruits acquitted themselves very well dancing with great enthusiasm and allowing us to field two sets for most of the dances. The occasional showers which created natural breaks between sets of dances enabled those present to enjoy the opportunity to chat to friends, old and new, and feast on chips generously supplied by Chris. It was particularly good to meet up with Robin Wilkinson, the oldest member present, who travelled from Norfolk via Surrey to attend. It was also great to welcome back Bob Southern, fit again after injury and our old friend Nick Duxbury, who made a guest appearance on Brighton Camp before he embarks on a year of extensive travelling. Thank you to all dancers, musicians, friends and family who made this a most enjoyable and memorable day of dancing. Often known as the Third Battle of Ypres or Passchendaele, the offensive began with encouraging gains but terrible summer weather soon bogged it down. By August the offensive was clearly failing in its objectives and had descended into attritional fighting. New techniques by both sides led to agonisingly slow forward movement for the British at enormous cost in casualties to both sides. Bad weather in October led to the battlefield becoming an impossible quagmire. 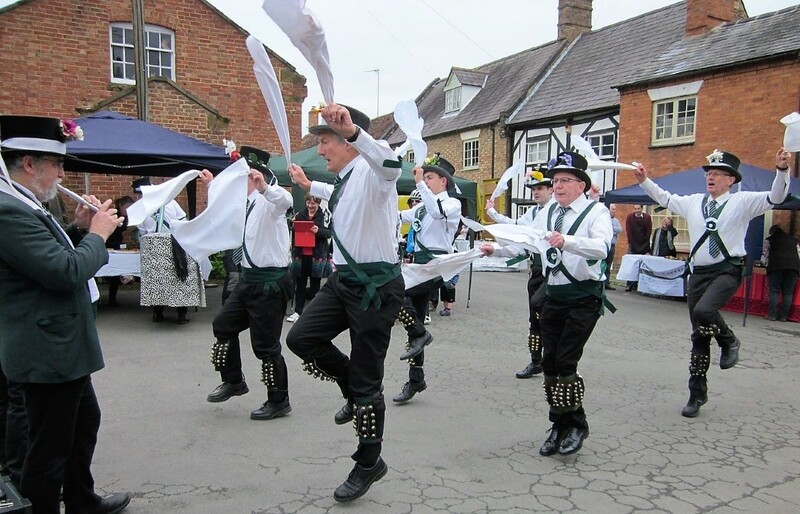 The AVMM memorial ceremony to honour George Robins, a former Adderbury Morris dancer, was held on Saturday 9th September at 10:30 am. Private Edward George Robins (1st/6th Battalion, the Gloucestershire Regiment, 144 Brigade, 48th Division, Army no. 267404) died from his wounds on 9 September 1917 aged 23 – he has no known grave. His regiment had been fighting at Ypres. The son of Frank and Rose Robins he was born in Twyford and is remembered on panel 72 to 75 of the Tyne Cot Memorial. St Mary’s Church bell-ringers rang a Quarter Peal at 10 o’clock, so we met at the lych-gate in Morris kit while this was still in progress. We gathered in the churchyard to plant a poppy cross in the Garden of Remembrance to the accompaniment of the eight half-muffled bells. Moving into church, we then performed a modified repeat of the ceremony we held at Tyne Cot. The proceedings were led by Jim Plester, using Bryan Sheppard’s text from 2008. David Reed read the poem Dulce Et Decorum Est by Wilfred Owen. The wreath provided by Edd Frost & Daughters was laid by Chris Garrett below the war memorial in the South wall, followed by a pause for silent remembrance. John Ekers read the poem Prelude by Robert William Service. The ceremony concluded with a celebration of the return of the Morris to the village through the efforts of Bryan Sheppard and Jim Plester among others, by us all singing The Happy Man. Six men then danced Shepherd’s Hey in the church aisle. This was preceded by the music once through on the instrument of the trenches, the harmonica played by David Reed. The main musicians were Jim Plester and Malcolm Wood. Men present were Troy Daniels, John Ekers (Squire), Christopher Garrett, Ryan Jamniuk, James Plester, David Reed, David Snell, Richard Teare and Malcolm Wood. Afterwards we danced Beaux of London City, Black Joke and Lads a’Bunchum, outside the library in Mill Lane. 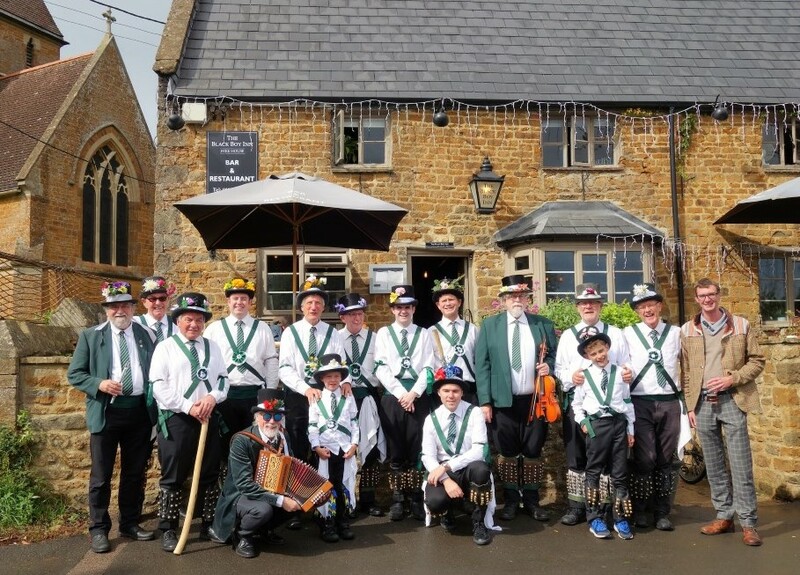 On Sunday 2 July, Adderbury’s three Morris sides gathered outside the Coach and Horses to welcome Minnesota Traditional Morris (MTM) a contingent of 19 dancers touring the UK. Founded in the autumn of 1974, MTM is based in the twin US cities of Minneapolis and St Paul and draws heavily on the Cotswold tradition. They told us that they share a large state-of-the-art meeting and training facility with other dance groups and that their building complex even has administrative staff. We told them that we practice in an ancient tithe barn with no heating or staff! They were impressive to watch and fun to chat with as they happily quaffed locally brewed refreshments with hip flask Laphroaig chasers. For the record we danced Sweet Jenny Jones, Black Joke, The Buffoon and Brighton Camp (with novice Jake Sheppard) at The Green – our grateful thanks to Keith Norton for dancing with us – then Princess Royal and Shepherd’s Hey jig in Mill Lane. After lunch at The Bell, Dave Reed, our resident expert on all things Morris, joined MTM in Mr Softee (Bledington style), a dance invented by Kingsessing Morris of Philadelphia about 30 years ago. A happy afternoon for UK-US Morris collaboration (as can be seen in the group photograph below) and the sun shone too. Saturday 17 June proved to be the start of a short heatwave and the hottest day of 2017 until then at 28C – that’s over 82F in old Morris money. For the second year we ventured into Flora Thompson country for a Beer Festival booking at her Candleford Green, in real life the village of Fringford. After a brief hiatus to muster the troops we put on a mercifully shortened set (in view of the strange burning thing in the sky) necessitated by the crowded entertainment programme laid on by the organisers. We kicked off with Sweet jenny Jones, then Constant Billy (it’s a swine on grass), Hail To The Chief and Roast Beef of Old England. Phil Taylor then volunteered to give us respite by doing a solo Jockey To The Fair – well played that man. We then finished off our first half with Shepherd’s Hey and Beaux of London City, before giving way to an interlude by the Fairground Organ. Its proud owner told us that the conclusion of “Tea for Two” was our signal to resume. There was just time for Haste to the Wedding, Washing Day, Lads a’Bunchum and Brighton Camp before the next singing act came on stage. Our thanks for assistance with dancing from beer-punter John and for photography by the stage soundman. AVMM had a busy day performing at three venues and completing 36 dances by the time we called a halt outside The Bell. David and Giles Snell, Ryan and John started the day at The Straw Kitchen in Whichford where Giles works. He was allowed to swap his apron for baldricks and a top hat and so impressed the patrons of the cafe and his boss, Maia, that she gave him the rest of the day off on condition that she and co-worker, Maya could join us on our last dance there. There was another big and appreciative crowd at the Great Tew School Fete where we were joined by Dorset Dave and his family on the occasion of his 71st birthday. We danced three sets here interspersing our performances with music from a couple of local bands and our former Squire played along on his new harmonica while hiding behind the horse box which served as a stage. Our regular performers were joined for a couple of dances by whistle player, Malcolm. Later on we enlisted a member of the crowd to replace him on our final dance. Unfortunately, he had been sampling Old Rosie from the bar rather too enthusiastically and struggled to master the sticking or to dance in straight lines. Patrons of the Fete were much amused. Our final venue was The Bell in Adderbury where we were due to be joined by Wyvern Jubilee Morris Men on their Cotswold weekend tour. They were running very late so we entertained the crowd with most of the dances from our repertoire and welcomed a most promising newcomer, John’s son-in-law, Troy. We also continued our policy of encouraging the youth wing of AVMM by introducing four of Dave and John’s grandchildren aged between four and seven to the joys of morris dancing in a slowed down version of Brighton Camp. By the time Wyvern finally arrived we decided to call it a day and leave the venue to our guests from the West Country who invited us for their 40th anniversary celebrations next year. Dave’s new harmonica was bedded in by this time and he managed a respectable Shepherd’s Hey alongside Wyvern’s accordionist. All in all it was a most enjoyable day of warm sunshine in beautiful surroundings. Congratulations to Ryan and Giles who are improving all the time and many thanks to our superb musicians, Donald, Dave and Malcolm. A cloudy afternoon in North Oxfordshire brought us to a regular annual booking in Wroxton, which despite the overcast sky was a throng of eager buyers at the many stalls. As usual we set up by the duckpond with its newly thatched duck-house and family of 14 fluffy ducklings hiding in the reeds. 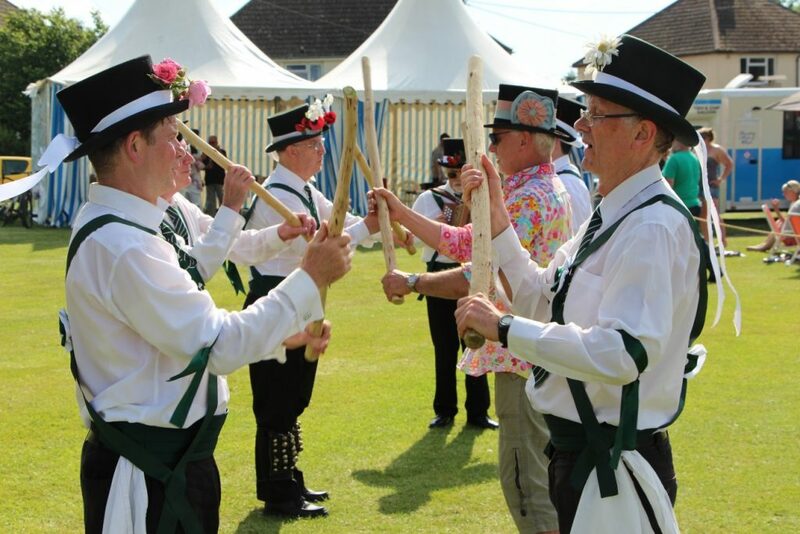 Kicking off with our traditional Sweet Jenny Jones, we followed up with nine set dances (Bluebells, Buffoon, Constant Billy, Flasher, Lads, Roast Beef, Hail to the Chief, Happy Man, Washing Days). Our mid-session refreshment was, for Morris Men, an unusual tipple of Pimms, and the second half included our Squire John Ekers and founder member Phil Taylor dancing the Jockey double jig. By this time, the rain was coming and prompted our fiddlers Jim Plester and Dave ‘Stovepipe’ Mortlock to case their instruments, leaving Malcolm on tinwhistle and Donald on buttonbox to brave it out. We finished up with an eight-man Brighton Camp including an enthusiastic enforced volunteer from Chicago who thoroughly enjoyed the experience despite acquiring some bruised knuckles. Our reception from the crowd was very rewarding and we have been re-booked for next year. Morris On. 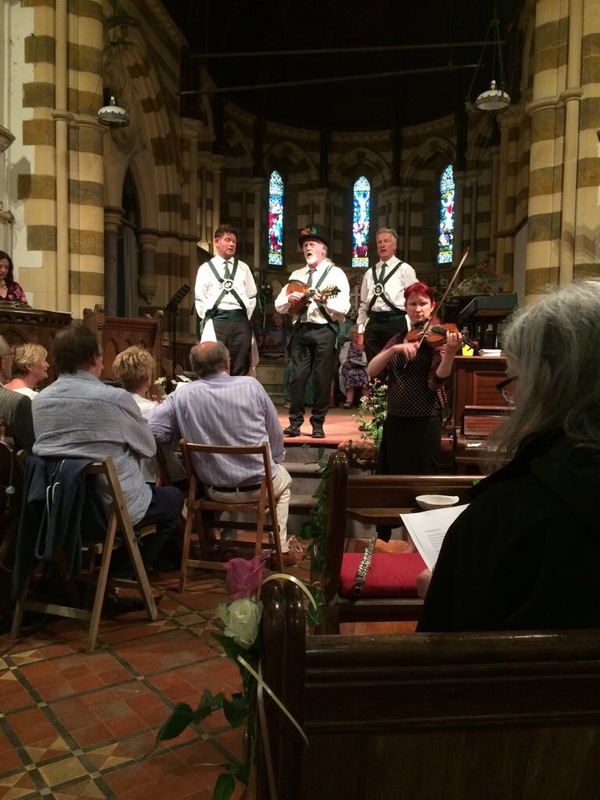 A reduced AVMM consisting of musician Donald McCombie and dancers David Snell and John Ekers entertained a large audience during a varied summer musical celebration at the beautiful old church of St Peter & Paul, Winderton. The church was built in 1877 but closed in 1981, is no longer a functioning church, but is kept in excellent condition by a group of friends and used for a variety of events. Donald and John talked about the AVMM tradition mentioning George Butterworth, Janet Blunt, the film The Way of the Morris and the revival side. The two dancers then performed four dances (SJJ, Shepherds’ Hey Jig, Roast Beef of Old English and Black Joke) on a carpeted stage in front of a seated audience and afterwards joined Donald in leading the singing of Wild Mountain Thyme. The Arras offensive 9 April -16 June 1917 was fought on the Western Front during World War One. The British were called upon to launch an attack in support to a larger French offensive. British troops attacked German defences near the French city of Arras and achieved the longest advance since trench warfare had begun. The British advance slowed in the next few days and the German defence recovered. The battle became a costly stalemate for both sides and by the end of the battle the British Third and First armies had suffered about 160,000 casualties and the German 6th Army 125,000 casualties. The war of 1914 – 1918 claimed the lives of thirty men from Adderbury. 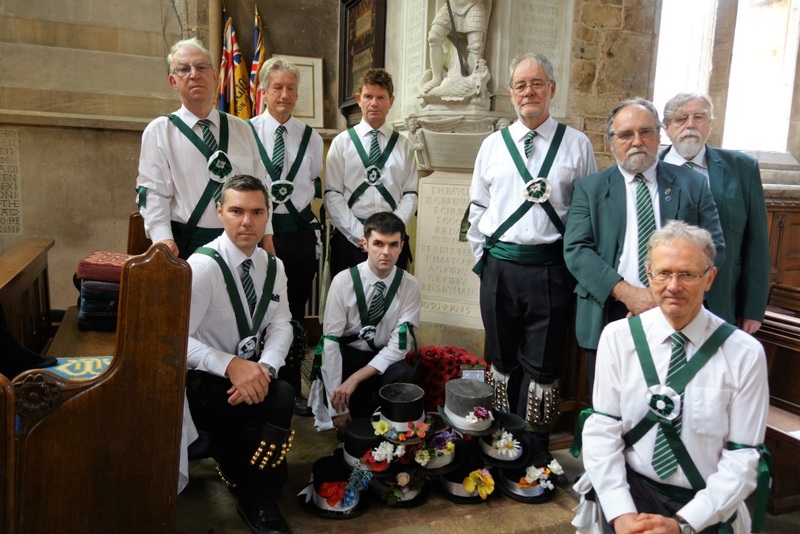 Each of these men is being commemorated throughout 2014 – 2018 by the bell-ringers of St. Mary’s Church by ringing a Quarter Peal on the centenary of each death. Of these thirty men, four were known to be members of Charlie Coleman’s Edwardian boys Morris side. The second of the Morris dancers to be lost was Private Harry Laurence Wallin of 1st Battalion, The Border Regiment, 87 Brigade, 29th Division, who was killed in action on 19 May 1917 in the fighting in the Somme. He was 23 and his body was never recovered. The Adderbury Village Morris Men honoured these four men, none of them having a known grave, by visiting their memorials in 2008, the 90th anniversary of the ending of WW1. Harry’s name is engraved on bay 6 of the Arras Memorial. He was the son of John and Elizabeth Wallin of Adderbury. We are again paying tribute to these past dancers by adding our own ceremony to the occasion of the bell-ringing. The Quarter Peal was being rung at 7:45pm on Friday 19 May 2017, so we met at the lych-gate in Morris kit at 7pm to remember Harry Wallin killed 100 years ago. 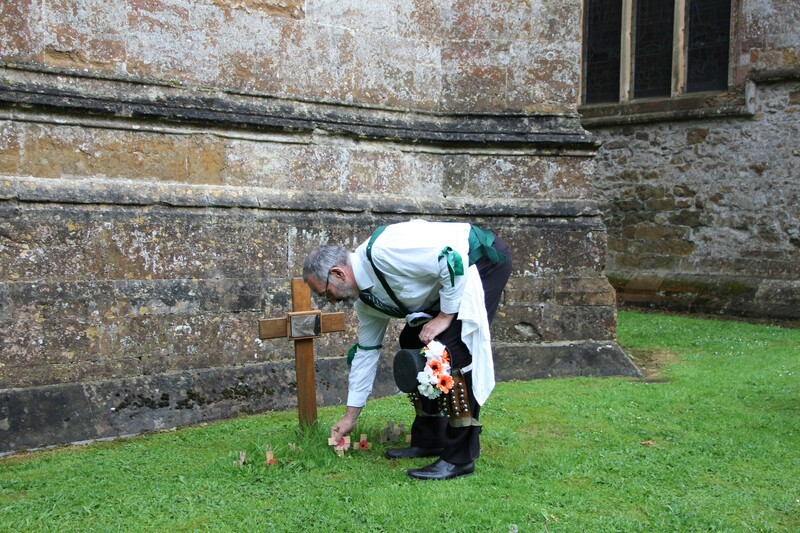 We gathered in the churchyard where Peter Jordon planted a poppy cross in the Garden of Remembrance. As we bowed our heads we heard distant thunder, eerily reminiscent of the sound of shelling that Harry must have endured. Moving into church we then performed a modified repeat of the ceremony we held at Arras. The proceedings were led by the Squire, who is indebted to Bryan Sheppard for the use of the text from 2008. Jim Plester read the poem Aftermath by Siegfried Sassoon. The wreath provided by Edd Frost & Daughters Family Funeral Directors was laid by Past Squire David Reed below the war memorial in the South wall, followed by a pause for silent remembrance. Chris Garrett read the poem The Courier by Richard Shindell. The ceremony concluded with a celebration of the return of the Morris to the village through the efforts of Bryan Sheppard and Jim Plester among others, by us all singing The Happy Man. Spirits were then lifted by a performance of the Shepherd’s Hey. This was preceded by the music once through on the instrument of the Trenches, the harmonica played by David Reed. The main musicians, Jim Plester, John Wright and Malcolm Wood took over for the six-man dance. Men present were Giles Brittin-Snell, John Ekers (Squire), Christopher Garrett, Christopher Holmes, Ryan Jamniuk, Peter Jordon, James Plester, David Reed, David Snell, Malcolm Wood and John Wright. Afterwards we danced Sweet Jenny Jones, Lads a’ Bunchum, Princess Royal and Brighton Camp in Mill Lane then as the sound of the half-muffled bells started the Quarter Peal we repaired appropriately to The Bell. 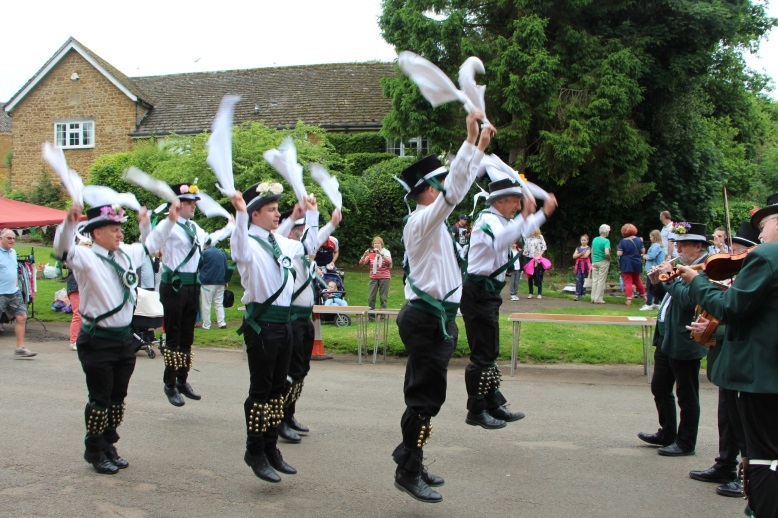 On Saturday 13 May, AVMM performed a long set of 15 different dances from their unique repertoire for the customers of the Farmers’ Market in Kineton. 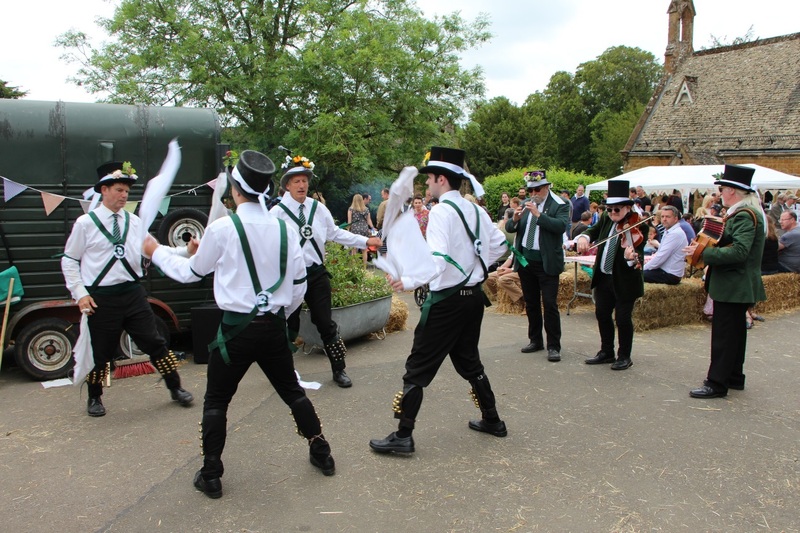 Nine dancers and two of our excellent musicians gave a very accomplished performance in spite of the fact that two new recruits, Ryan and Giles, had only previously danced in public once before at the Day of Dance.